Different foods require varying customization for a cutting machine. 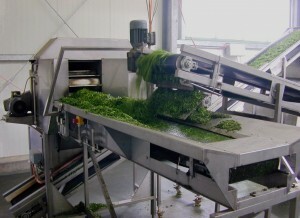 We can build appropriate cutting machines for preparing sheet material and vegetables prior to drying. All machine parts are made of stainless steel and provide good access for maintenance and cleaning. BINDER’s leafy vegetable cutting machine is characterized by its robust design, adjustable cutting widths and high throughput. This machine is ideally suited for grinding of fresh sheet material such as parsley, spinach, dill, chervil, etc.. With a throughput capacity of up to 3 tonnes / hour, these cutting machines are often used in many of our processing lines. The cutting machine is also suitable for this purpose cutting the product when it is removed from the machine. BINDER has also developed a strip cutting machine, which works well for products such as chili peppers, with high throughput. 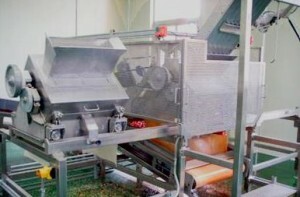 It is designed as a single or alternating cutting station for use in a continuous processing line. The machine is characterized by a very short cutting time. Depending on the cut and product, throughputs of up to 4 tonnes / hour is possible.